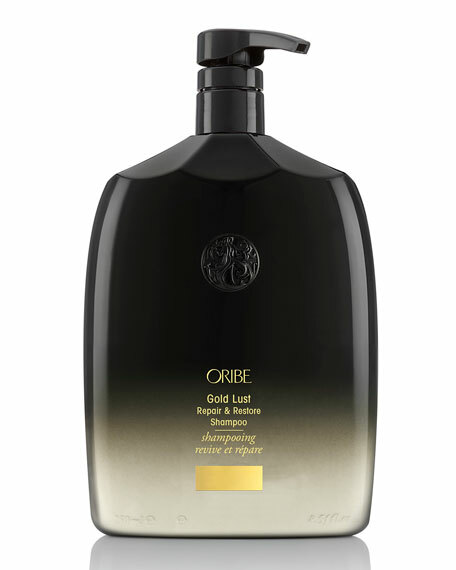 Oribe Gold Lust Repair & Restore Shampoo, 33.8 oz. Reawaken your hair to its glossiest, healthiest prime. This rejuvenating cleanser combines centuries-old healing oils and extracts cypress, argan and maracuja with our revolutionary bio-restorative complex to balance the scalp and reinforce the inner strength of each strand. Lather, indulge, rinse. Anyone, especially those with hair that has been damaged by time, styling or processing. Rejuvenates hair so it appears more youthful and healthy. Reinforces the inner strength of each strand. Energizes and balances the scalp while promoting circulation. Formulated without parabens, sulfates or sodium chloride.